A unique range of smart power solutions. LightwaveRF provides a range of smartphone controlled 13A sockets in metallic designer finishes designed to match the dimmer switch range. Each socket is mains rated at 13A and approved to BS 1363. They accommodate standard wiring and 35mm back boxes. No extra wiring is required. 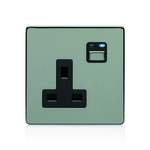 Plug & Play adapter sockets give all the benefits of remote control in seconds without any re-wiring at all. Just plug them into an existing standard socket to provide instant control, grouping, dimming and mood lighting. 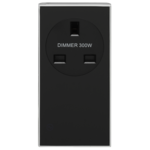 Dimmers can handle up to 300W and on/off sockets can be used to switch devices rated at up to 13A. In-line relays are also available to switch large circuits via a handset or the App. The ‘socket-lock’ facility allows sockets to be locked off using the LightwaveRF App or socket locker. This can help with child safety around dangerous appliances, or prevent unintentional switch-off of appliances such as a fridge freezer. What can i do with LightwaveRF power control? It was once casually suggested that there were probably ‘101 ways’ that you could use LightwaveRF. We later decided to challenge ourselves to come up with them. Click on the scenarios below to discover just some of the 101 things that you can do that involves LightwaveRF power control. A simple yet much underestimated piece of kit is the LightwaveRF Wire-free Switch. You can use this device to trigger any number of Lightwave devices at once. You can also do this with the Scene Selector (Mood Lighting Controller) or the Mood Remote. At the press of one button, you can trigger dimmers and plugin sockets to turn on all of your lounge lamps, or perhaps turn off all of your sockets and standbys when you leave. LightwaveRF 13A power sockets can be remotely locked to prevent any appliances that are plugged into them being manually turned on or off. Being able to remotely lock LightwaveRF Sockets from the App or the Socket Locker remote allows you to ensure that the kids are safe around potentially dangerous appliances such as the kettle or microwave. You can also lock essential appliances such as a fridge freezer on to prevent accidental switch off. 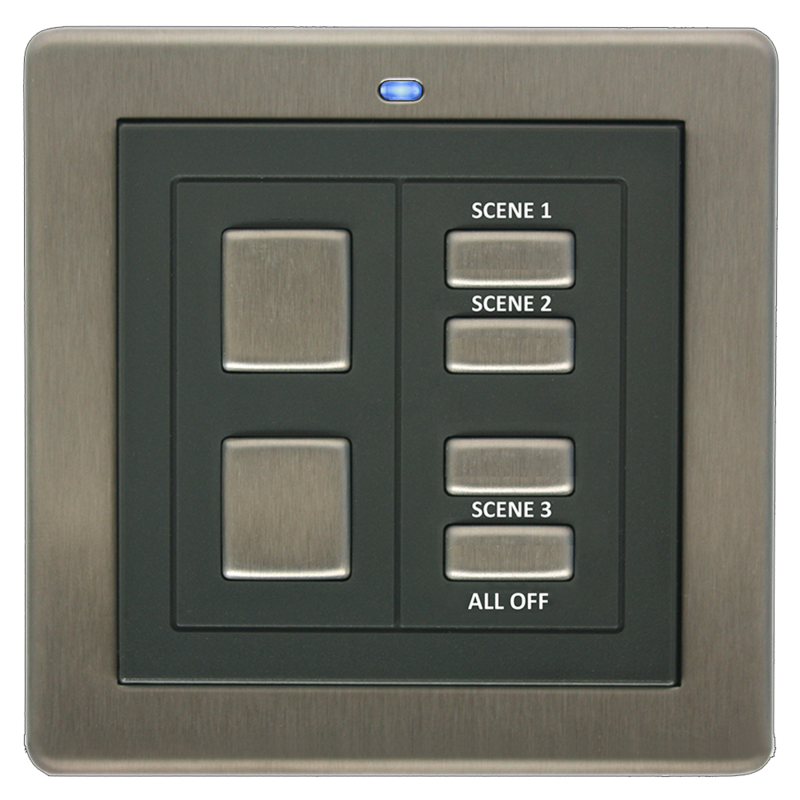 Scene control provides a very convenient way to set the level of all of your room lights at once and recall it as a favourite saved setup. With the press of a single button on a LightwaveRF Mood Remote or Controller, Scene Setter, or the App, you can dim selected lights and lamps to provide the perfect atmosphere for watching a movie or to create a relaxed mood for entertaining guests. You can even include power sockets into the scene. Traditionally, scene lighting has been complex, expensive and hardwired. LightwaveRF is different. It’s wireless, much simpler to install and setup, and more affordable! New modules can be added at any time, and adjustments to preset scenes can be made in seconds. Any LightwaveRF dimmers, power sockets or plug-in sockets can be included into a scene. Using the LightwaveRF app to set a random timer event, you can ensure that your lights will turn on and off at random times whilst you are away, during the evening or on holiday. This provides added security by giving the illusion that you are at home when you are not.